The Expedition Leader’s call brings passengers bolting up the stairs to the upper decks, their card games and half-finished books forgotten in the lounge or library (for now). You round the corner and step out the heavy metal door onto the deck, and… there it is! Jagged, snow-capped peaks cast their long shadow over the frozen rock beach below. It’s unimaginably white, the sky an almost impossible blue. It takes your breath away. This first sighting is just the beginning. The days ahead promise sightings of and interactions with animals you won’t find anywhere else outside of captivity; with penguins, seals and whales who’ve never known the fear of human interference. Your heart races in anticipation of thrilling Zodiac excursions, hiking completely alien territory, and the excitement of trying to take it all in via every sense, and through the lens of your camera. How is Antarctica different from the Arctic? What can I see in Antarctica? What can I do in Antarctica? When should I go to Antarctica? Why choose a small expedition ship for my Antarctic adventure? How can I get to Antarctica? You can read this post in full, or simply skip ahead to the section that provides the information you need. Let’s get started! Some people have a very clearly defined vision of what a trip to Antarctica will mean for them. For others, it’s been a lifelong dream; an item on their bucket list. Others still are in search of an epic, off the beaten path adventure and find that Antarctica fits the bill. Whatever your motivations, the seventh continent offers an experience unlike any other. A trip like this can have a profound effect on your physical and mental health, giving you a chance to get offline, digitally detox, and enjoy exploring one of the world’s last untouched wilderness areas. The unexpected nature of expedition travel nurtures in us traits we may not often have time to work on: openness, extraversion, and conscientiousness. It gives us a chance to get over our fears, reduce the stress in our lives and just focus on the experience. The polar regions, while they share the temperature and precipitation similarities of polar deserts, are incredibly different. While the Arctic is made up of many land masses around an area that’s mostly ocean, Antarctica is a continent on its own. The area we visit, the Antarctic Peninsula in West Antarctica, is an archipelago of islands overlaid and held together by a thick sheet of ice. In fact, the ice sheet that covers Antarctica is the largest on earth and covers 3 million to 19 million square kilometers, depending on the season. Antarctica has no large land predators, which is a great thing for its penguin population! You’ll visit penguin colonies and learn how to tell the different species apart, by the end of your trip. The lack of land predators also allows us to do incredible activities, like camping out under the night sky on the seventh continent. Those penguins have to be careful in the water, though, as they have particularly vicious predators in the leopard seal and orca whale. Depending on your itinerary and the conditions, you might also get to see Weddell seals, different penguin species, snow petrels and more. On an expedition, you never know where you might go next! Each itinerary has an outline and over the course of your expedition, the Expedition Leader and ship’s Captain work together to chart the safest and most interesting course, with respect to the weather and sea/ice conditions. Over the decades they’ve been guiding in the region, our seasoned team members have learned which landings sites, bays, and beaches offer the greatest opportunities to explore Antarctica’s fascinating history and unique wildlife. In the heart of the Errera Channel lies Cuverville Island, home to an active population of Gentoo penguins. Mid-season, you’ll see them nesting on rocky outcroppings and waddling back and forth to the sea, to clean up. Twilight falls at the entrance to the Lemaire Channel, one of the most picturesque areas to photograph on an Antarctic expedition. Cruising the spectacular Lemaire Channel between the mainland and the Booth Island (off the Graham Coast) is an exceptional privilege; thick sea ice often prevents its passage. At its south end lies Pleneau Island, in an area known as Iceberg Alley for its phenomenal iceberg displays. Thousands of Adelies, chinstraps and gentoo penguins nest at Gourdin Island, making it a very special place to land and explore. Guide Daven Hafey shares what to expect in Unforgettable, Rugged & Raw: Gourdin Island, Antarctica. If your expedition is stopping at Port Lockroy, you’ll have a chance to send postcards home from the Penguin Post Office! Tour the museum, explore the gift shop and take photos with the gentoo penguin colony outside. On your way to or from Antarctica, you might stop in the South Shetland or the South Orkney Islands. Glacier-encrusted and mountainous, the South Shetland Islands are a picturesque gateway between the Drake Passage and Antarctic Peninsula, which lies about 100km from the bottom of the islands. Many, like Barrientos Island, are home to colonies of penguins you may view from Zodiacs, or even meet onshore. The South Orkney Islands are further north, approximately 600 km northeast of the Peninsula. Snow falls on this group of four main islands, on average, 280 days a year, contributing to the inhospitable climate. Free of human inhabitation, the islands are home penguins and many types of seabirds, including the pure white snow petrel. Penguins appear to rush out to greet the Quark Expeditions ship, as passengers in Zodiacs head to shore in the Falkland Islands (Islas Malvinas). Biologically diverse and historically significant, the Falkland Islands (Islas Malvinas) are a massive archipelago of 778 islands located 483 km off the coast of Argentina. Birdwatching is excellent here, with 63 breeding species and 23 annual migrants to seek out. You might visit the historic town of Port Stanley, venture out to the internationally recognized Important Bird Area that is West Point Island or see the spectacular white sand beaches on Saunders Island. Check out the Top Falkland Islands Landing Sites post to learn more. A popular destination in its own right, the island of South Georgia was once an important seal and whale hunting outpost, as well as the final resting place of Sir Ernest Shackleton. In fact, you can participate in a ceremony paying homage to the famed Antarctic explorer at the cemetery at Grytviken Church. Read more about Shackleton’s epic journey and how visitors remember him today here. Today, the island is known by many as the “Galapagos of the Antarctic,” both land and water teeming with wildlife including Southern Elephant seals, massive colonies of penguins and more. The island is a designated Important Bird Area and as such, is recognized internationally as a crucial habitat for the conservation of bird populations. Your responsible tourism helps fund important conservation programs like South Georgia Heritage Trust’s (SGHT) Habitat Restoration Project, which is just one of the sustainability initiatives we support. Learn more about life on South Georgia here from one of our expedition team members, Dr. Sam Crimmin, who spent an entire year on the island. You never know what you might see, from one minute to the next! Passengers describe Antarctica in so many different ways—for some, it’s like going back in time; for others, it seems like a completely alien planet. Visiting Antarctica is an entirely personal and incredibly rewarding experience. The Falkland Islands and South Georgia should definitely be on your list. Lengthier journeys like Falklands, South Georgia, and Antarctica: Explorers and Kings and Epic Antarctica: Crossing the Circle via Falklands and South Georgia all give you ample opportunity to explore these remote islands and the diverse wildlife that call them home. Visiting these islands gives you the chance to see fur seals and Southern Elephant seals, predatory leopard seals, different species of penguins in large colonies, albatross and other seabirds, endemic species like the South Georgia Pipit, and more. You won’t just see wildlife while you’re in the Zodiacs or on land, though. Each expedition ship has open decks and an open bridge, creating ongoing wildlife viewing opportunities over the course of your trip. You might have seabirds tagging along with the ship for hours, or spot whales near the ship at any time. Penguins and seals hauled out on icebergs off the Antarctic Peninsula coastline make for great photos, as well. Expedition travel in the ice-choked waters around the Antarctic Peninsula is a constant balancing act. You’re sure to see icebergs; the trick your Expedition Leader and Captain are working on is getting you close to these incredible displays while still charting a clear course to your next destination. 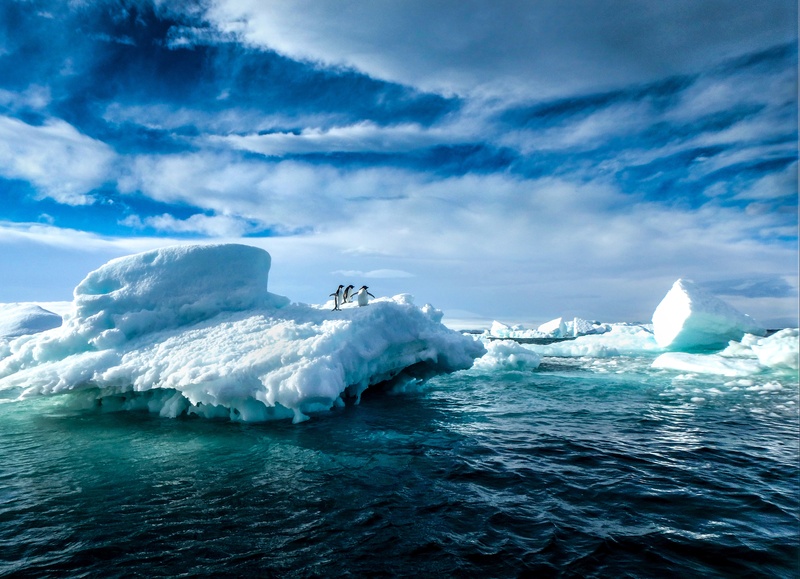 Where conditions allow, experienced expedition team members will guide you in Zodiacs around and between icebergs in waters around areas like Pleneau Island, Wilhelmina Bay, and just off Paulet Island, where passenger Katrina Zinger captured her award-winning photo on penguins on ice. The diversity of the Falkland Islands, South Georgia, and Antarctic Peninsula make each place a unique and spectacular place for landscape photography. Activities like guided hikes, snowshoeing, and kayaking can all help you experience Antarctica from a different vantage point. Snowshoers enjoy an exclusive vantage point from high atop a ridge on the Antarctic Peninsula. Make sure you bring the right equipment. Dave from The Planet D offers some great tips for preparing your Antarctic photography camera bag here. Practice your photo composition skills and camera settings before you go. Expedition team member and photography guide Acacia Johnson offers a helpful lesson in taking better polar travel photos here. In South Georgia, you might visit the Grytviken Church and share in a toast to Sir Ernest Shackleton. You could explore a site like Base Y on Horseshoe Island, an experience Diane Erecg shared in her post, Stepping Back Into Polar History. Of course, Deception Island is a favorite stopping off point for history lovers. Whatever your itinerary, you can explore Antarctica’s rich history at landing sites, in the onboard Polar Library, in expert lectures given onboard, and with experienced guides in the field. Antarctic expeditions area fast-paced, with plenty of learning and socializing onboard on top of your excursions in the field. 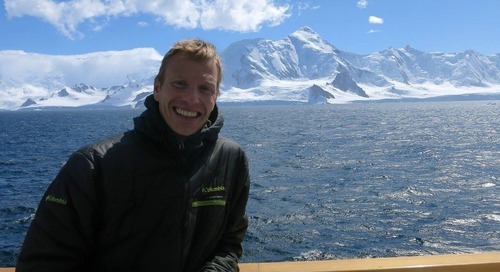 While on the ship, you’re invited to attend expert lectures about topics including polar history, geology and marine biology from Expedition Team members, scientists-in-residence, and special guests like penguinologist Dr. Tom Hart from Penguin Watch. You can borrow materials or pull up a chair in the Polar Library to learn more about Antarctic wildlife and the golden age of exploration. You’ll spend time on deck, watching for penguins and seals hauled out on icebergs, or whales spouting and breaching nearby. Of course, nothing beats the excitement of getting out into the wilds of Antarctica and exploring, which you’ll do whenever possible! There are different ways to experience Antarctica, as well, and everything you need to enjoy each adventure option is provided. Some Adventure Options are included in the price of your voyage, while the paid activities require you to reserve at the time of your booking. Quark Expeditions has the most robust collection of Adventure Options in the industry, allowing you to personalize your voyage to what you’re most interested in. Guided walks and hikes of varying levels of difficulty are a part of every Antarctic expedition. As weather and sea conditions permit, you’ll be transported by Zodiac cruiser to shore landings, where you’ll have a chance to explore each site’s unique geology and geography, polar plant life (if any), animals and birds, and history. Snow poles and snowshoes may be available, depending on conditions. Exploring the landscape on foot is the best way to appreciate the environment. Vigorous or contemplative, hiking participation is optional. Explore communities and shorelines and enjoy chance encounters with iconic wildlife. Walking on top of the snow is a novel way to experience the polar landscape, discovering the remove alcoves and hidden valleys. Snowshoes let you reach spots inaccessible by foot. It’s a polar rite of passage, and everyone onboard has the option to take part! Don’t worry—expedition team members have you tethered on and are ready to pull you in, if needed. If you aren’t sure whether the polar plunge is for you, make sure you read passenger Craig Shaw’s story to see what it’s really like. Daily chats and presentations with onboard experts—our guides, scientists, and other special guests—lets you rub shoulders with historians, botanists, ornithologists, zoologists, geologists and more. Documenting your voyage so you can take the memories home is both rewarding and constructive—and is next to impossible to take a bad photo in Antarctica. You will also have access to an onboard Photography Guide who can give you tips and tricks about using your camera or smartphone. Each expedition offers bird watching opportunities from the open decks and in the field. You’ll be traveling alongside ornithologists like Fabrice Genevois who will help you spot rare seabirds including wandering Albatross, petrels, skuas and more! In addition to these beautiful birds often following behind the ship in open water, you’ll enjoy Zodiac cruises to nearby bird cliffs with thousands of breeding species. This is not your average yoga retreat. The onboard yoga program on our Antarctic expeditions presents unique challenges, in that you’re practicing on a moving ship. Your experienced yoga instructor will keep you low to the ground, often focusing on restorative and meditative yoga to help you get the most out of the entire expedition experience. As a participant in the Sea Kayaking program, you’ll have opportunities throughout your expedition (weather permitting) to experience Antarctica as the seals and penguins do, from the surface of its pristine waters! Your kayak, skirting, paddle, professional kayaking guide and accompanying Zodiac are all part of the program. If you’re an experienced kayaker looking for a unique vantage point from which to explore Antarctica, this is the kayaking program for you. Never been in a kayak before? No problem! Our new Paddling Excursion option was designed for passengers with no kayaking experience but who still wanted to get out on the water and take in the sights of Antarctica. For 1 to 1.5 hours, you’ll have the chance to paddle past icebergs on a guided tour, and possibly see penguins, seals and even whales nearby! The provided sit-on-top kayaks are very stable and safe, allowing you to focus on enjoying an unforgettable adventure. Passengers use stable sit-on-top kayaks on Paddling Excursions to explore breathtaking landscapes. Can you imagine anything more magical than waking up on the seventh continent? It’s a dream come true for those who register in advance for the Camping in Antarctica option, offered on select voyages. Spend a night tucked into a cozy sleeping bag and bivvy bag in the open air, but register early as this program typically sells out. Offered on select voyages, cross-country skiing is an adventure option for those looking for an entirely unique vantage point from which to view Antarctica. Exploring the seventh continent with a small group of fellow skiers, you may have the opportunity to visit penguin colonies or reach summits inaccessible to hikers. Register early (preferably while you book your expedition), as this program fills quickly. Boots, crampons, ice axe, harness, helmet and expert leadership are all provided on guided mountaineering adventures in Antarctica. It’s an exhilarating way to see the bottom of the world from on high! Available on select voyages. A passenger glides over the surface of pristine, glass-still Antarctic waters on a standup paddleboard. Be one with the spectacular Antarctic landscape. Standup paddleboarding just might be the ultimate in both excitement and zen on the seventh continent. Everything you need to take part is included, although you may want to take a few practice runs in warmer waters before signing up. Available on select voyages. One of the questions we’re asked most often about planning an Antarctic expedition is, when should I visit? Experiencing the reawakening of Antarctica after its winter season; the landscape is pristine and pure, and pack ice is beginning to melt. Adventures like Antarctic camping, stand-up paddleboarding, and kayaking. Mating penguins and seabirds, with all of the courtship ritual and activity that entails! Humpback, minke, orca and other whales, who return to feed on krill in the waters just off the Antarctic Peninsula. Weddell seals come ashore to molt and give birth. Incredible iceberg photography; they’re at their greatest mass, and snow-white to deep aquamarine in color, thanks to air trapped inside. Slightly warmer temperatures and up to 20 hours of sunlight per day. The most active period for wildlife, including different species of penguins as they begin hatching and tending their young. Spectacular iceberg displays, as the sun and salt water wear at each one, carving them into natural artwork. Fantastic whale watching in places like Wilhelmina Bay (which is why we call it Whale-amina Bay!). Epic sunsets, as the days begin to shorten again and the sun truly sets each evening. Better access to landing sites further south from mid-February to the end of the season, as the pack ice continues to recede. The greatest chance at hearing or witnessing the spectacle of a glacier calving an iceberg, as the relatively warmer weather works its magic even in typically freezing temperatures. Humpback, orca and minke whale watching. Entertainment in the penguin colonies, as the young begin to grow their adult feathers and learn to swim, hunt, and steal pebbles from other nests. The sun sets over Leith Cove, Antarctica, setting the sky alight with spectacular hues of pink, orange and red. When it comes to expedition travel in the polar regions, small ships definitely have advantages! Ice-strengthened expedition ships carrying less than 200 passengers, can access areas large cruise ships simply cannot. Each one is equipped with Zodiac for safe, comfortable exploring and transfers from ship to shore. Our expedition ships are comfortable, too. After a day packed with activities and exploring some of the most remote terrain and waters on the planet, you’ll kick back with chef-prepared meals, a fully stocked and professionally tended bar, and a cabin with closets, ensuite bath and more amenities than you’d expect in a hotel setting. Perhaps the most compelling reason for choosing a small expedition ship for your Antarctic adventure is the authentic experience it offers. Small ships give you access to more remote beaches, and narrower fjords and channels. It’s not hard to imagine what life was like for those Heroic Age explorers, as you stand on the open decks with nothing but pristine Antarctic wilderness in sight. From the highlights of the Antarctic Peninsula, to in-depth explorations of wildlife havens South Georgia and the Falkland Islands, to Fly/Cruise options for those short on time, there’s a trip to fit your needs. Experience the South Shetlands and Antarctica in 10 or 11 days on the popular classic Antarctic Explorer: Discovering the 7th Continent expedition, with your choice of adventure options, depending on the departure you choose. Take a 14-day odyssey into rarely explored territory on the Crossing the Circle: Southern Expedition, or add South Georgia and the Falkland Islands, as well, on the 23-day Epic Antarctica: Crossing the Circle via Falklands and South Georgia. There are plenty of ways to customize your experience, as Quark offers the most in-depth coverage of the Antarctic region. In the over 30 years that we’ve taken passengers to the Polar Regions, we’ve learned that what creates the ultimate polar experience isn’t the same for everyone. That’s why we offer our passengers more choice than any other provider, ensuring our expeditions are always personalized to what matters most for our passengers. From choosing your departure city to selecting one of our ice-strengthened ships to enjoying a robust selection of Adventure Options, we’ll help you plan the perfect Antarctic adventure. Skip the infamous Drake Passage crossing with a comfortable charter flight from Punta Arenas to King George Island, Antarctica. You’ll enjoy incredible aerial views and a quick rush of adrenaline from jumping right into the action. Flying over the Drake means you can explore King George Island and the Antarctic Peninsula in just 8 or 11 days, or journey far enough south to cross into the Antarctic Circle in 11 days. It’s a great choice for those who want to save time on the crossings to spend on other South American travel, like Corina Hitchcock, who shared her Fly/Cruise story here. Our 2018.19 collection of Antarctic expeditions promises a great range of options, and you can enjoy substantial savings with Early Booking Bonuses (see Ways to Save for more). Antarctica may be closer than you think... expeditions start at just $5,595 and our current offers can help make your expedition dreams a reality. Read Expedition Tales from travelers just like you, who’ve recently returned from their own polar adventures. Download your free Antarctica Destination Guide. Browse our Antarctic Expedition itineraries. There’s an expedition to suit very traveler, with over 41 departures across 8 diverse itineraries in the 2019.20 Antarctic season. Our 2019.20 collection of Antarctic expeditions promises an even greater range of options, and you can enjoy substantial savings with Early Booking Bonuses (see Ways to Save for more).